Step into luxury when you board this 2006 Sunstar 18’x90’ houseboat! Step aboard on the roomy bow to find plenty of storage in 2 large rope lockers and 2 large hatches giving access to a below deck storage area. A separate hatch gives access to the 8 inverter batteries. Forward is an easily accessible anchor windless and to starboard are the shore power connections. 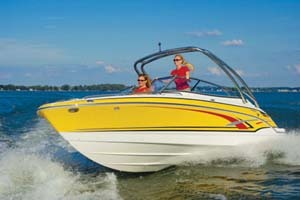 A removable enclosure helps extend your boating season along with a full screen enclosure to keep the pests at bay. Enter the salon and be ready to be amazed. The salon is absolutely cavernous and luxurious. The Cumberland Ash wood creates a great canvas for the black and red décor. Port offers a large black leather sectional couch to sit and enjoy the well-appointed entertainment center. 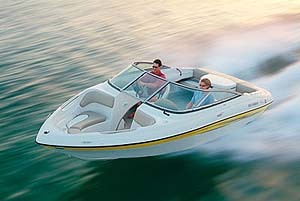 The lower helm featuring electronic controls, including a stern thruster to allow confident maneuvering of this vessel. Mid ship is the elegant dining area with a built-in dinette with seating for 6 and bonus storage cabinets underneath. To port of the dining area is the well-appointed L shaped galley with all modern amenities. Features include all full sized appliances such as, a refrigerator/freezer with ice maker, smooth top range with oven, dishwasher, trash compactor, and built-in microwave. Solid hard wood cabinets grace the galley. All the amenities of home, but in a vacation paradise. Off of the dining area and down 3 steps to the forward cuddy. This room features two twin size beds, built in dressers, and TV. Move down the port hallway to the VIP Stateroom with queen sized bed, large closet, drawer storage, and TV. Accessible from the VIP Stateroom and the hall is the guest bath. Features include a shower and large vanity. Aft of the VIP bath and down 3 steps is the aft cuddy. This room has two twin beds, drawer storage, and TV. Aft you will find a spacious Master Stateroom featuring a king sized island bed, large sliding glass doors for a panaramic view, built-in dresser and large closets. Master Bath is spacious with its large vanity, linen closet, and shower. The aft deck makes the perfect balcony for the Master Stateroom and a nice way to enjoy the water. 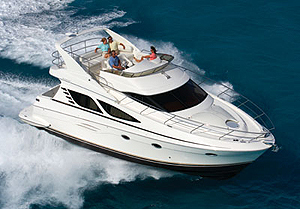 Two large hatches offer easy access to the economical Mercruiser 3.0 Liter engines and generator. To make battery maintenance a snap, there is a built in battery compartment under a third smaller hatch. Check out the 4 foot swim deck with retractable swim ladder, diving board, and two jet-ski ramps with power winch. Move up the stairs to the top deck to find the ultimate entertainment spot. 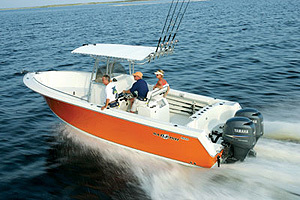 The fly bridge has a large seating area with 12' hard top, along with the upper helm. Top deck also includes 2 large bars with seating for 10+. Plenty of room for fun and sun. A 30’ hard top keeps you cool and in the shade. This houseboat is truly a must see. 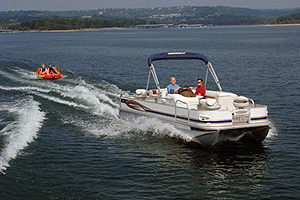 It includes all the space and amenities to enjoy the water without leaving the comforts of home. 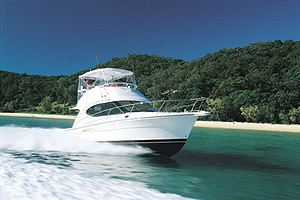 This boat features many amenities and lots of room to entertain family and friends. Few on the market at this price are this clean, this well equipped, and this luxurious. Call today to make an appointment and get ready to be amazed. And get ready to go boating.